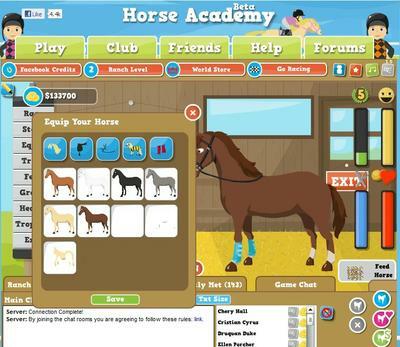 In this Facebook horse game you can buy, sell, train, and breed your horse or horses. You can have as many horses as you want. When you start off you get to select your horse’s gender, color, and name but not the breed. Along the way, you must take care of your horse or horses. You groom them, feed them etc. Then you get to decide if you want to train and compete with your horse in show jumping or racing. You can also design your property into the stables of your dreams. You must earn money to build your stables by winning competitions and other activities. I believe you can use Facebook Credits in this game but I am not positive. You can chat with other riders so there is an interactive component to this game. The game’s graphics are not so great but they are ok. But you don’t have to download it since you play on Facebook. 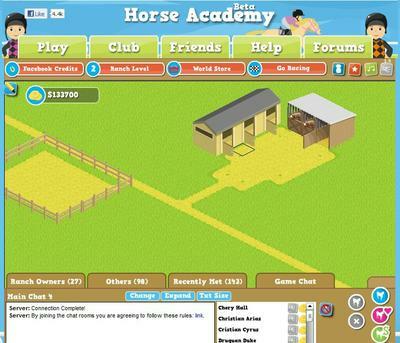 Have you played Horse Academy on Facebook? If so, please be sure to comment or share your tips below!